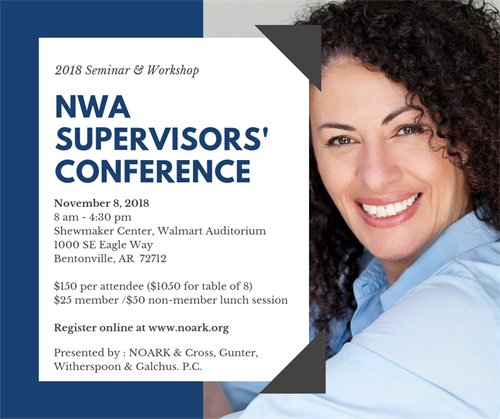 The 2018 NWA Supervisors’ Conference is your one-day, all inclusive supervising and managing people experience. Whether you are new to supervising or an experienced manager, this conference is for you! You know that no matter what your job is, “Job One” is the managing of people. Everything else goes just a little easier when your people are happy and productive. The more you know about effectively managing people in today’s ever-changing workplace, the better equipped you are to solve problems, encourage engagement, and align the efforts of your department with your organization’s overall mission – and if you attended last year’s conference – or heard about it – you know our presenters are experts in providing managers and supervisors with what you need to know, and do, to successfully and lawfully manage people. Presented by NOARK and Cross, Gunter, Witherspoon & Galchus, P.C.